Hageman Lane Princeton, New Jersey. The interior of this classic home provides spectacular views of the surrounding property while retaining a sense of intimacy. The gracious two-story living room is enhanced by a custom wrought iron railing mimicking the branches of the surrounding trees, combining spaciousness with warmth. The kitchen and the dining room open onto a central courtyard providing easy access for informal entertaining. A central hallway divides the formal living spaces from the private bedrooms. A lower level library is surrounded with beautiful, red oak paneling. Numerous specialized finishes were incorporated such as antique French limestone and reclaimed terra cotta tiles, custom wrought iron railings, cast stone fireplaces, red oak paneling, custom moldings and tumbled marble tile. Oak Ridge Court Princeton, New Jersey. 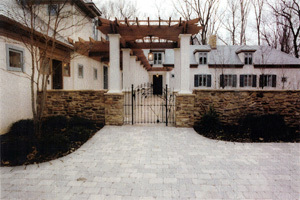 Constructed in 1995, this house was designed in the Shingle Style, which was popular at the turn of the century. The Shingle Style has influences routed in the Queen Anne, Colonial Revival, and Richardsonian Romanesque styles. The Oak Ridge Court house has upper exterior walls of shingles, lower walls of stone and stucco, windows with panes only in the upper sashes, and intersecting rooflines. 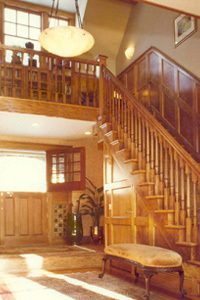 The two-story entry hall with its wood paneled walls and grand staircase highlights the interior of the house. The fireplaces in the entry hall and family room have tiles made by Fulper Tiles of Yardley, Pennsylvania. Fulper was a guiding force for art pottery at the turn of the century. The living room fireplace has tiles made by Peace Valley Tiles of Doylestown, rich with oak leaf motifs. The master bedroom fireplace has tiles made by the Moravian Tile Works also of Doylestown founded by the eccentric Henry Mercer, a proponent of the American arts and Crafts movement. Other interior details are abstracted from the Mission, Arts and Crafts and Edwardian pereiods and their use is typical of house that harmoniously combined elements of many styles at the end of the 19th century.